In ritual, we express our deepest yearnings towards what we hold to be of greatest worth. Some rituals can be shared with people who see the world differently; other rituals can’t be shared. That’s OK. In Wicca, it’s possible for a polytheist and an atheist and a duotheist and an animist to circle together, if we share the same values and a similar practice. I wouldn’t circle with someone who was a racist or a homophobe or a transphobe – but I am fine with people with different theological perspectives, as long as they respect my theological perspective. We might even refine our working hypotheses of how it all works by engaging in dialogue. But one of the guidelines of interfaith dialogue is deep listening and being open to the other person’s perspective. This means not grandstanding, not defining polytheism or Paganism so narrowly that a whole bunch of people get defined outside of it, and not telling the other side that they are deluded or stupid. If you express disdain and condescension towards people who believe the gods are real beings with agency, you’re probably not going to get invited to my circle any time soon. Conversely, if you’re one of those people who believe that atheists or archetypalists can’t be Pagans, you’re also not likely to get invited. If you can be respectful towards people who hold different views, you are much more likely to get invited. Of course, you might not be interested, and that’s fine too. As long as you can respect my relational mystical polytheist Wicca, I will respect whatever your view is. This is the sacred ethic of hospitality: if I invite you into my space, I have certain obligations as the host, and you have obligations as a guest. The ethic of hospitality is one of mutually respectful behaviour. I love the god Pan, but I do so in my own way. Upon my first meeting with a fellow Panhead I couldn’t help but notice that this particular devotee did it completely differently than I did. And you know what? I was completely cool with that, because I realized that there were of course many ways to honor and worship Pan. … I’ve been pretty public with my own thoughts about the nature of deity, but I think I’ve made it pretty clear that I don’t care if people agree with me or not. I don’t think there are right or wrong answers that apply to all of Pagandom. Certainly within specific traditions there are shared bits of theology and belief, but why anyone thinks a Devotional Polytheist and an Eclectic Wiccan have to come to some sort of consensus on deity is beyond me. Can’t we all just nod politely at one another and accept each other’s reality? Jason is welcome in my circle any day of the week – he clearly grasps the ethic of hospitality. Some people are trying to say who can call themselves a polytheist, or a Wiccan, or some other label (and I agree that it makes it difficult to communicate if we radically change the meaning of a particular label; but the fact is, polytheist just means belief in many gods, and Wicca started life as just a euphemism for witchcraft). There are people who are theoretically entitled to be in my circle as duly initiated Gardnerian Wiccans who absolutely would not be welcome in my circle – yet they are entitled to call themselves Gardnerian Wiccans, as duly initiated people. Their philosophy, theology, and values are completely different from mine, and they don’t behave respectfully. So I just have to decide whether I want them in my circle or not on the basis of trust, not on what they call themselves. You can tell people not to call themselves something (whether it’s polytheist or Wiccan or whatever) until you’re blue in the face, but they’re not going to stop. Nevertheless, identity and membership are two different things. You can identify as something, but if members of that community don’t recognise you as being that thing, then it’s hard to sustain that identity. It’s a reciprocal process (rather like hospitality). 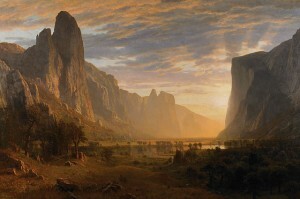 Looking Down Yosemite Valley (1865), Birmingham Museum of Art, Birmingham, Alabama – by Albert Bierstadt – forum.netfotograf.com, Public Domain. I agree with her – I don’t think for a moment that this humanoid form is necessarily their only form. Someone once described deities as “possibly anthropomorphic interfaces of vast cosmic forces” – a description that sums it up pretty well for me. Whilst deities are not merely archetypes, they do include archetypal qualities (I am not merely an archetype, but I include archetypal qualities – I am a fairly typical geek, for example; I’d quite like to be a femme fatale, but sadly I failed the exam). To me, polytheism means belief in many gods, and doesn’t include anything about defining what gods are or how we relate to them. Devotional polytheism means serving or being devoted to them and believing they have agency and are entities. Relational polytheism is forming relationships with them and believing they have agency and are entities. If people want to define a specific tradition within polytheism as having even more requirements, good for them. But I don’t think you can define simple polytheism beyond meaning belief in many gods. Some people view polytheism as a container for polytheist traditions such as Heathenry, Kemeticism etc. But as a polytheist Wiccan, I don’t fit within that definition – because Wicca includes people with other theological viewpoints (and the same is true for Druidry). Why don’t I join an explicitly polytheist tradition? Because they are all focused on one pantheon and culture and I’m not. I’m English, so I’m a mixture of Saxon, Celt, and possibly even Norman – and anyway my spirituality is linked to the land on which I live, not my ethnicity. And I don’t mind sharing Wicca with people of other theological viewpoints – as long as I’m free to behave polytheistically in my own circle. 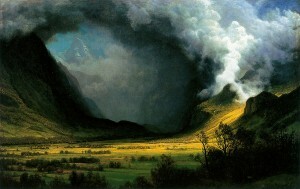 Storm in the Mountains (1870) by Albert Bierstadt – arthistory.about.com, Public Domain. The nature of reality can be viewed from many different perspectives: on the quantum level, everything is quarks and leptons and bosons and strangeness and charm. At the level of chemistry, it’s all about the chemical interactions; on the cellular biology level, cells join and divide and exchange chemical signals. On a psychological level, no-one would deny that love and hate and other emotions are real, and only the most reductionist person would insist that they are merely biochemical signals. Then there are interpersonal relationships, social movements, discourses, historical trends, and other macro-level processes, all the way up to the movement of galaxies and the expansion of the universe. From the perspective of the universe, our little lives are pretty insignificant; from my personal perspective, my life is very significant to me. I would say that something is “real” if it has a real effect on existence. In this view, ideas are real because they affect people’s lives. However, ideas are not things, and they are not people. That’s why the “gods have agency” part of contemporary polytheism is important, because gods are not just ideas or archetypes, but beings with will and agency. On the whole, though, that is a matter of faith, although there are plenty of people experiencing the gods as beings with will and agency. In my daily interactions I engage with Brighid as sun, fire, and hearth. Also as inspiration and light, and swan and the greening of the earth. I engage with Boann as cow, river, and the Milky Way. I engage with Lugh as lightening. So, it makes no sense to me to engage in debates about whether the sun is real, for example. Maybe existentially we could debate that, I suppose, but that would not alter my engagement with or experience of the sun in its physical and spiritual aspects, or take away from them. But the corporeality, that physical body of the sun, is generally taken as evident by most, even where our spiritual relationship with it will differ depending on tradition, worldview, regionality, and/or personal inclination, as these are all distinct spiritual ecologies with some degree of possibility for overlaps among them. I have always thought that the deities of Nature are the emergent consciousness of complex phenomena, such as sacred places, mountains, trees, storms, forests, and so on. If this is the case, then any anthropomorphic appearance they choose to adopt is only one aspect or facet of their vast and complex nature. And we cannot say with any certainty that we know them fully, or that we know exactly what they are. We can only say that we do experience them as distinct beings with agency, and that when we experience the presence of a deity, we know that we are blessed by their presence. When I feel the presence of a deity, I feel their unique personality and energy. Some are reassuring and comforting; others feel more remote and challenging; but all are beings of majesty and power. 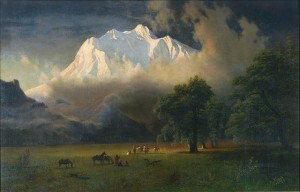 Mount Adams, Washington (1875), by Albert Bierstadt – Princeton University Art Museum, Public Domain.